Your entire outdoor living area  your yard, patio, porch, walkway, and gardens  should be an expression of your personal philosophy and style, and an outgrowth of good aesthetic sensibilities and practical design concepts. 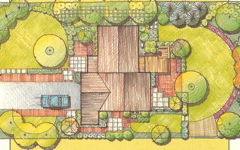 Sunshine Landscapes will arrange a free consultation at your site to determine your landscape design needs and goals. 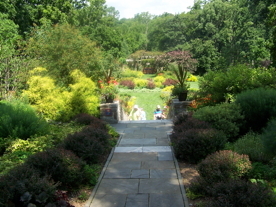 Senior landscape designer Jamie Milden, with 30 years of landscaping experience, is an expert in all aspects of landscape design and installation, and will work closely with you to achieve your perfect outdoor living environment. The first step is the consultation. Jamie will come to your property for an expert onsite evaluation to determine how our custom landscape design will highlight your property and improve your lifestyle. He will make recommendations and some general cost estimates after determining your needs and the requirements of your property. Jamie often uses a plot plan to make initial measurements (see the images below). 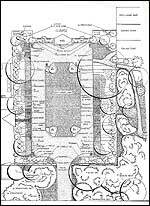 He will first make a preliminary drawing and then explain all the choices of plants to customize the landscape design to fit the needs of your home. A written estimate will be provided free of charge after the consultation. Prior to any work being done, you will receive a detailed contract including information about materials, costs, tentative start date (we're at the mercy of Mother Nature! ), and approximate time frame for work. The landscape design that Jamie and Sunshine Landscapes creates for you will be a year-round exterior living space that expresses your individual style and highlights the best aspects of your property.